A little over 8 years ago we moved into our brand new home. 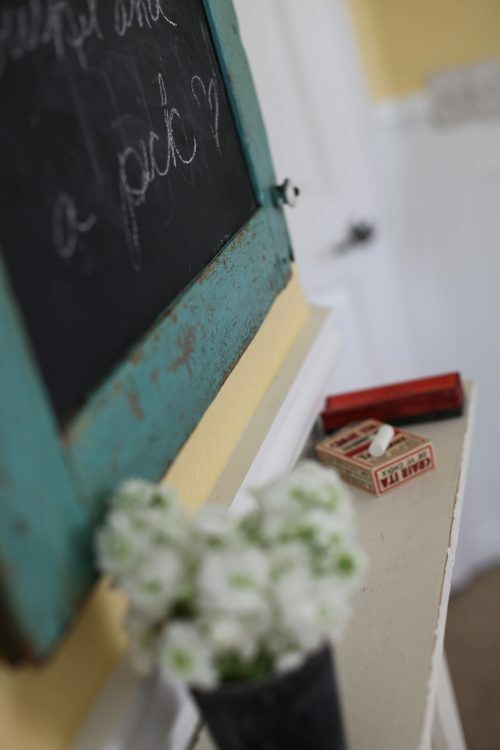 I am an older house kind of girl so a new house means lots of work to bring even a touch of character. We have spent years adding built in bookshelves, beadboard, wainscoting, crown molding etc. We have changed out lots of lighting and have tried to create little nooks around this home of ours. The first room we painted over 8 years ago was Madolyn’s nursery. It really was such a pretty nursery. We had custom sage toile roman shades and bedding made. It was pink and sage and so sweet. We also had big girl bedding made to help the room grow with her. After 8 years we knew it was time for a change. At first I was coming up with all these ideas for her room. I was thinking blues, greys, creams and whites. I was thinking a crystal chandelier and linen bedding. The thing is that Maddy was all for it and she does love blue….but….I knew that the room was for me not her. I started to really think about her and her personality. I decided to go a completely different direction and I scratched all my other ideas. We started putting yellow paint samples on the wall. Maddy and I spent a lot of time looking at vintage fabrics and pulling our fabrics together. A few trips to The Barn followed. Her very favorite color, turquoise, would be on display. We had to recruit daddy to do some woodwork and then I followed up with many (many) coats of white paint. The icing on the cake for Maddy was the lighting that she had picked out. At night the shadow of flowers covers her walls and ceiling….and she couldn’t be happier. We are all in love with her room and how it turned out. It is completely her…just the way we wanted it! I have linked up to my friend Jen’s linky party. 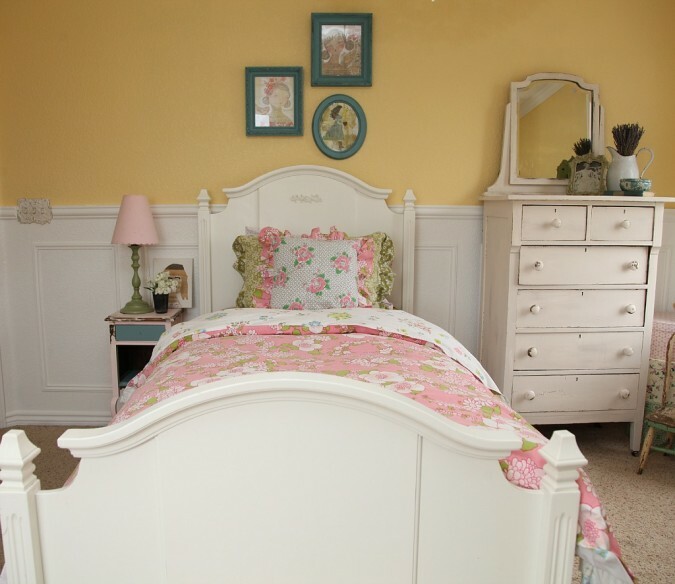 Check out the other rooms that have used molding to make huge transformations. 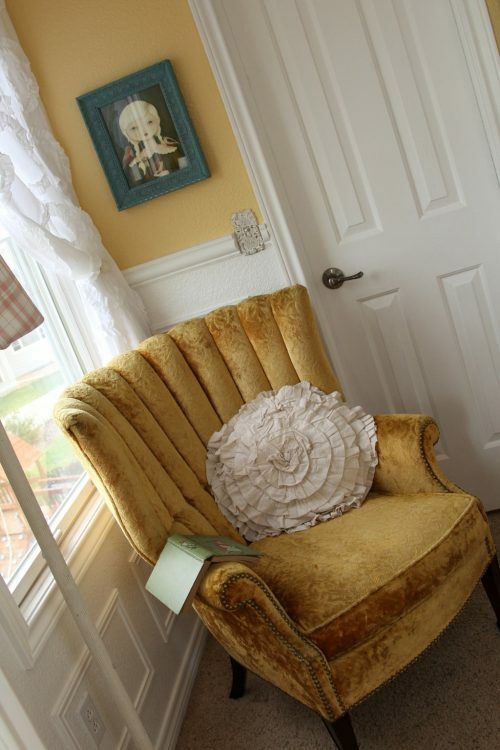 I recognize that round ruffled pillow : ) It was mine and I sold it to Amy LOL I’m glad it found a good home! 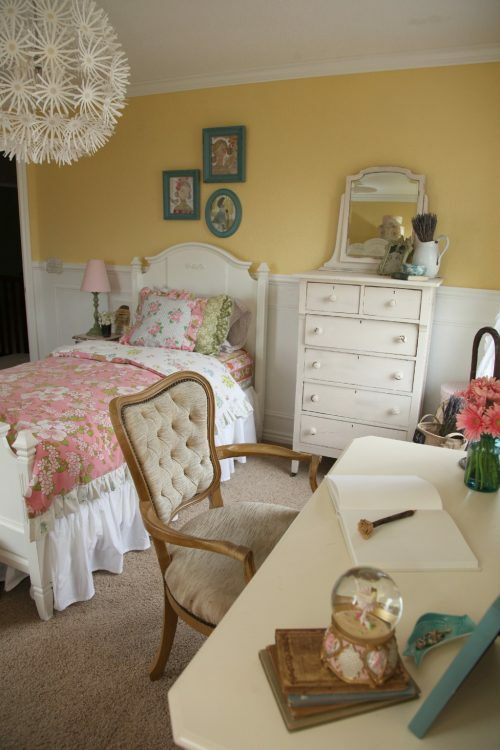 (assuming that you DID actually buy that from Amy haha) Maddy’s room is absolutely beautiful! Did you make the hat boxes or buy them? I’ve been trying to find some! 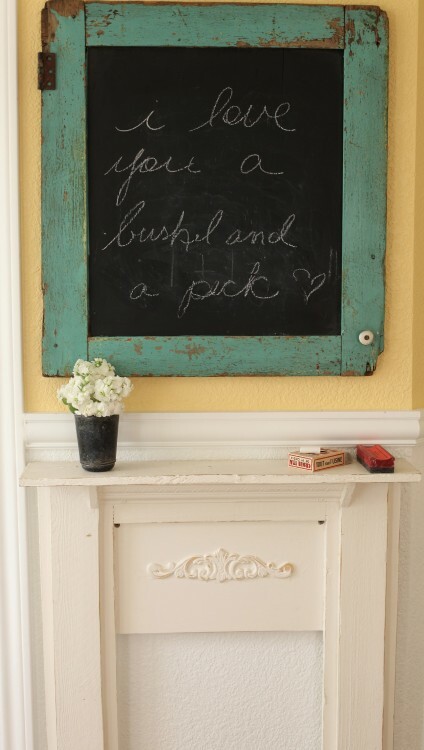 AND I think my favorite part of the entire room is sthe chalkboard/mini mantel nook! Oh my goodness it is SO cute! I want one too!!! Love it all! Thanks for sharing! We have a very similar color of paint in our room – I LOVE IT! I love the artwork above her bed <3 and her comfy reading chair. And that light fixture – the girl's got good taste! What a darling room. You and Maddy did a great job! Did you make the curtains or purchase them? I love the fabric. jeanne…really, what can’t you do? gorgeous and so perfect in every way! 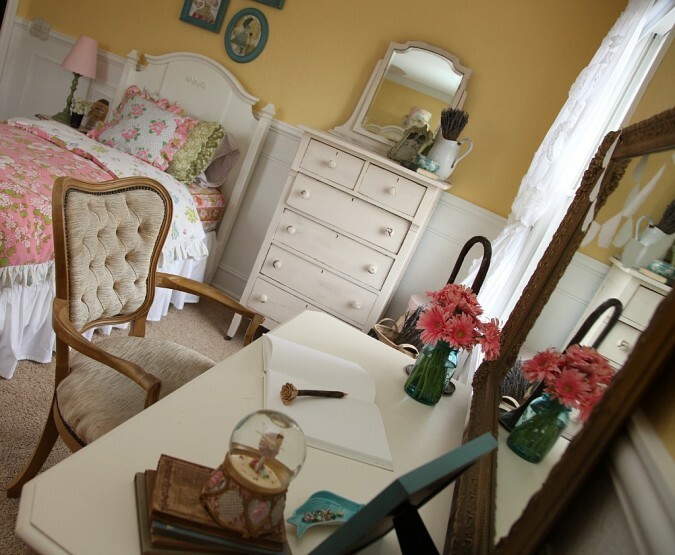 Dearest sweet Jeanne, her room is really so beautiful! I am loving the gorgeous color palette! 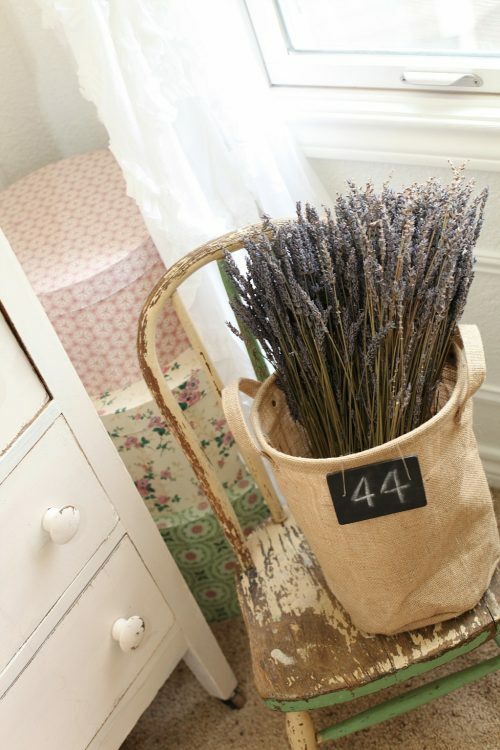 I love the vintage feel and look of this room! Truly amazing. Have a lovely merry happy day and love to you! It turned out so cute! I love the photos of her sitting in her chair, perfect. I absolutely love it! Every detail! This room is just so special. You have a great touch with decorating! 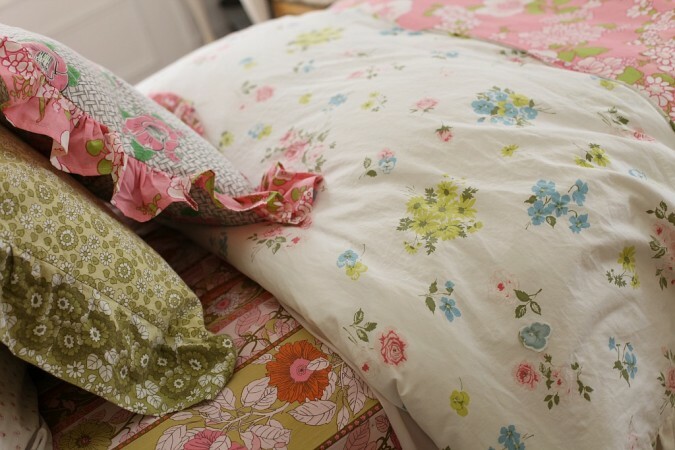 I’m currently making a quilt for my little girl to move into her first ‘big girls bed’…would you mind sharing where you bought your bed skirt from? I’m hoping it’s from an online shop – I’m from New Zealand! Thanks for sharing your gorgeous room! This room is just adorable! I love the tiny fireplace mantle and the cozy chair for reading! I just painted my bathroom a very similar color and it turned out really great–love the all white look, but also wanted some color again. Must have been fun for you two to do this together–lucky Madolyn!! Jeanne, I am about 10 years older than you ( I am guessing here, Im 46) but would it be possible for you to ADOPT me and let me be your daughter? You could fix up a room for me and I promise I will be oh so very, very happy in it!!! OMG, that room is so freakin pretty. Forget about it being for a young lady, I want it for this old hen, hahahaha. LOVE LOVE LOVE your style gurlfren. it is the cutest room ever. i love every inch of it. thanks to you and maddy for letting me stay in her beautiful room. great photos jeanne!!! Oh that room is lovely!!! What a beautiful job you’ve done on it for her! No wonder shes jumpng for joy!! 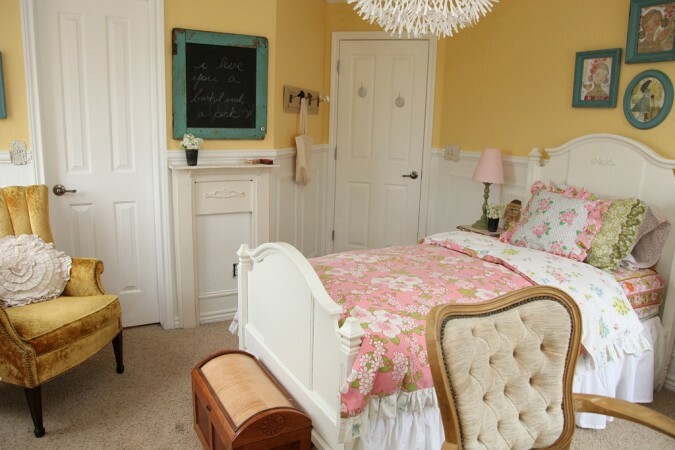 I just adore Maddie’s new room….I especially love that yellow chair, the light and of course your artwork above her bed… can I be your daughter too…. what a wonderful perfect space for her!! i love the yellow and turqoise & the light fixture of course!! Oh how nice, you’ve done a lovely job – the room is just gorgeous! Gorgeous, and your photography is amazing. You’re one talented lady! I am in LOVE with this room. It looks like something I would’ve chosen for my own room. 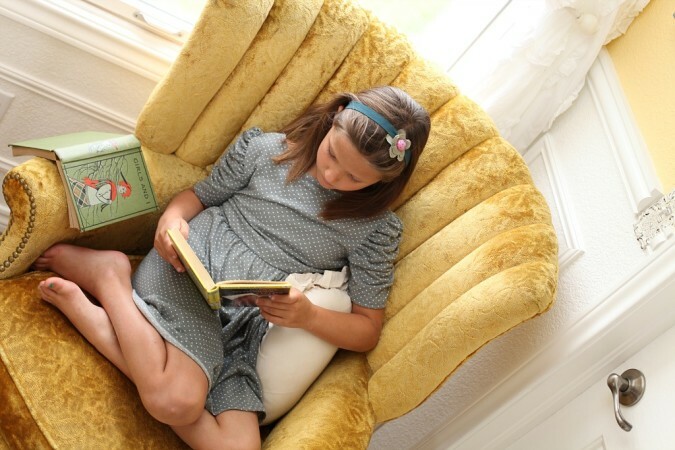 The picture of Amy in her reading chair gets me! My oldest could never take her nose out of a book. The years go flying by, but I’m sure she’ll always remember when she got to redecorate her room (with her Mom) for the first time. I, too, love the hat boxes, so sweet. I’d love to here more about that mantel and how you & hubby made it. I love it. Lovely room and even lovelier daughter. Tugs at my “Mama” heart. Thanks for sharing!! everything. precious, fun, and beautiful. way to go, mom, dad, and maddy!!!! that light rocks, maddy! It looks so beautiful! It is even better in person! 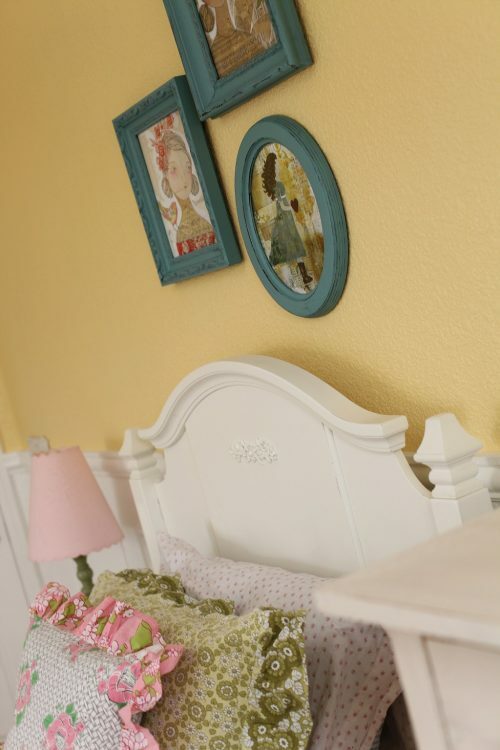 It’s the perfect little girls room! Oh! Jeanne, a room of her own to love! Giving her beautiful thought and then creating a room to love! I love it, I wish I were a littel girl it is a perfect place to rest her heart on! I have crazy ideas about what to do for my daughter as well, and then taking a step back listening to what she wants to live with is what love and style is all about, soulfully creating a space that dreams are fulfilled! You my girl have a beautiful knack in creating a childs dream room and it comes to you naturally. It truly is a room torn from our favorite magazine pages. Oh what an absolutely beautiful room…every detail is gorgeous!! Ummm. I would live in Maddy’s room, and I’m not going to tell you how old I am! I have seen that light fixture before and LOOOVE it! Glad to see her happy, although I know as a parent it is sometimes hard to see that growth in our children…no longer “little” but becoming “young”. This is just so beautiful! Love the color combinations! I am going to show this to my little girl (22) in hopes that she will keep hers more tidy! 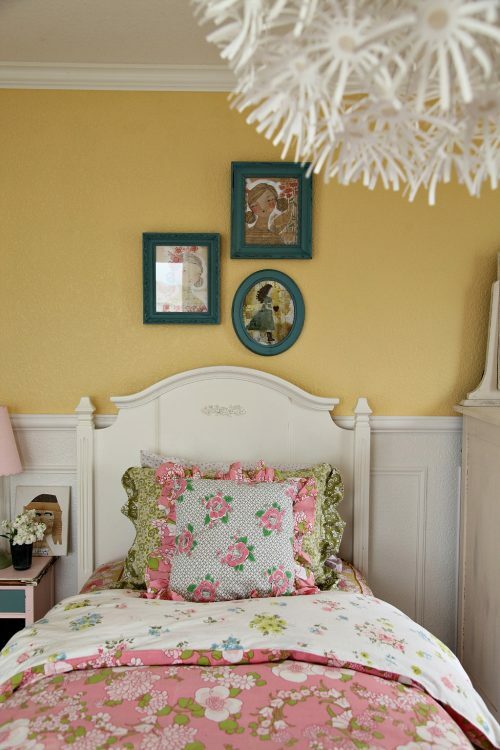 What a darling room! Where did you find that amazing light fixture??? Oh Jeanne, this is beautiful!!! 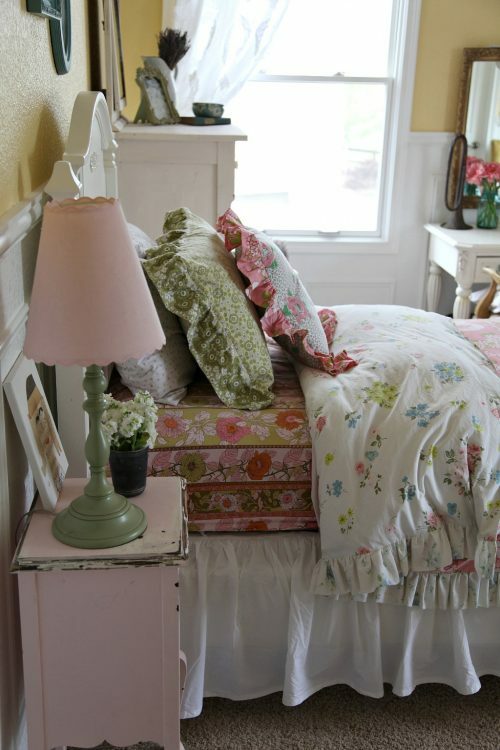 I love little girl’s rooms that look like little girls live there. Don’t get me wrong, I love a gorgeous white room just as much as the next gal(I have them too) but I think childhood is so special and kids should live in it as long as possible. What a special space you created together? p.s. I am TOTALLY stealing that fireplace and mantel idea for Laya’s big girl room!!!!! Lovely room! Simply stated feminine. 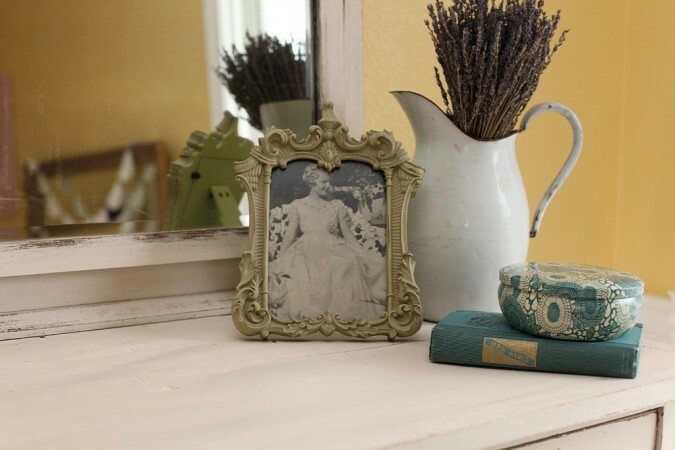 I was wondering if the blue picture frames were purchased in that color or if you DIY’ed them? 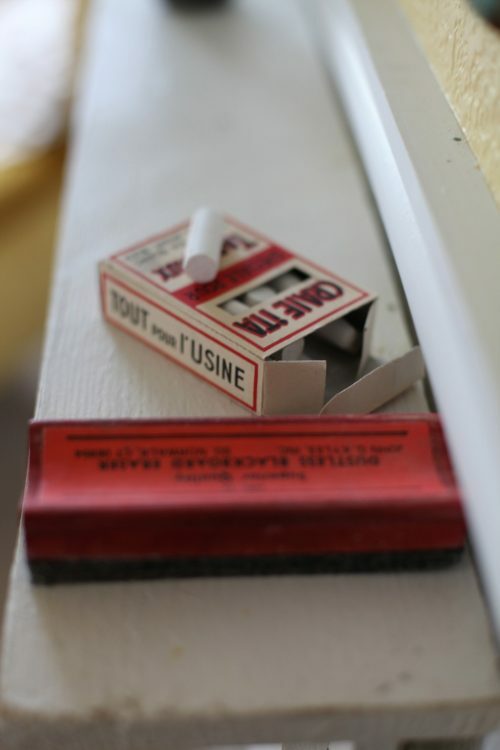 Would love to know either; the color of paint used or where you found the frames in that color. I love the color. 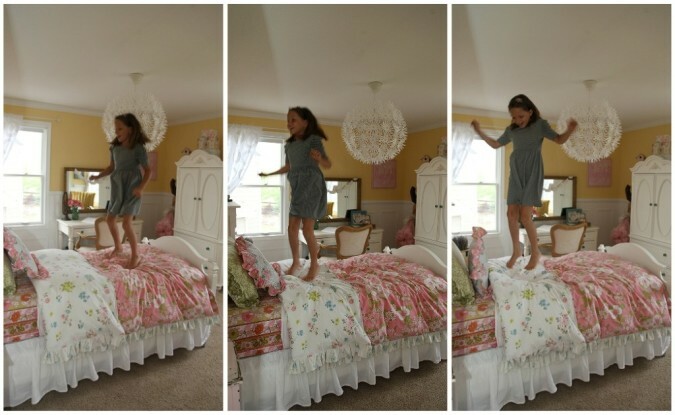 Jeanne – I am in love with Maddy’s room. What a lucky girl! 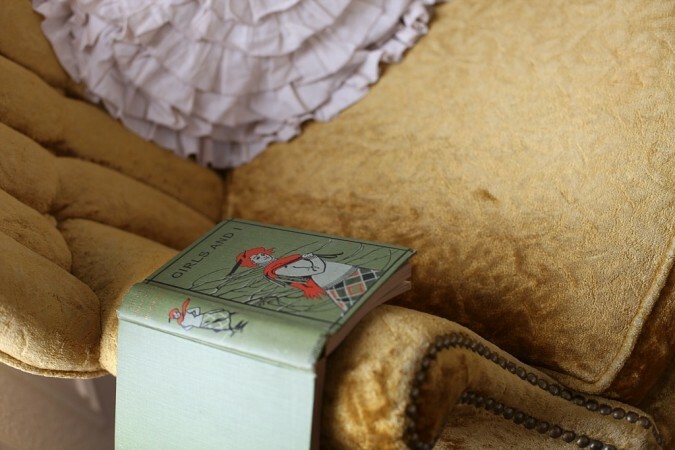 I have the same ruffled round pillow from the barn. Maddy’s room is a dream. It is perfect for now and for her to grow into. Just lovely!